October 2007 issue of ezine focusses on "Marketing Communicationt". Eminent personalities like Mr Vinod Harith, Group Marketing Manager of Wipro at London, Lisa Ditlefsen, Head of Search & Web Analytics, Base One Search, London and many Marketing experts have shared their views. The Guest Editor for this issue is Ms Subha Ganesh, Search Marketing Consultant, London. This issue brings out the need for Corporates to use Integrated Communication for Marketing. September issue of PR-e-Sense focusses on "Time Management". Eminent personalities like Mr S Narendra (Former Information Advisor to Indian Prime Ministers) and Ms Nipa Shah (President, Jenesys Group, LLC, Michigan) and many others have shared their views. This issue also gives practical tips to manage the time more efficiently and effectively, with suitable case studies. Institute of Public Relations of Singapore (IPRS) organised a one day conference at Singapore on 1st August 2007 on the theme "PR 2.0 - Engagng stakeholders in the new media landscape"
Ms K. Bhavani is the Guest Editor of August issue of ezine PR-e-Sense. This issue covers broadly the proceedings of the conference. We have also produced a podcast, based on the conference, with the views of experts. This issue of Corporate ezine PR-e-Sense is based on the theme "Development of youth and their professional skills". For this issue, we had requested Mr Tushar Panchal, Vice President, Rediffusion PR to be the Guest Editor. In this issue, he has brought out the exclusive views of Mr Al Ries (Co-Author of the book Fall of Advertisement and Raise of PR). Other eminent professional leaders like Mr Roger Periera, Mr. Harish Bijoor and Mr Anurag Batra have also shared their views in this ezine. This edition of PR-e-Sense carries the theme "Corporate Podcasts"
In this edition, we carry the views of Mr Sunil Nair (CEO, Nautanki TV),, Mr Syed Nazir Razik (Technocrat and Entrepreneur) and Ms Chinmayee (a well known Radio and Television Jockey and Play back singer). The podcast also contains a sample piece of "Corporate podcast" for an electronic product. 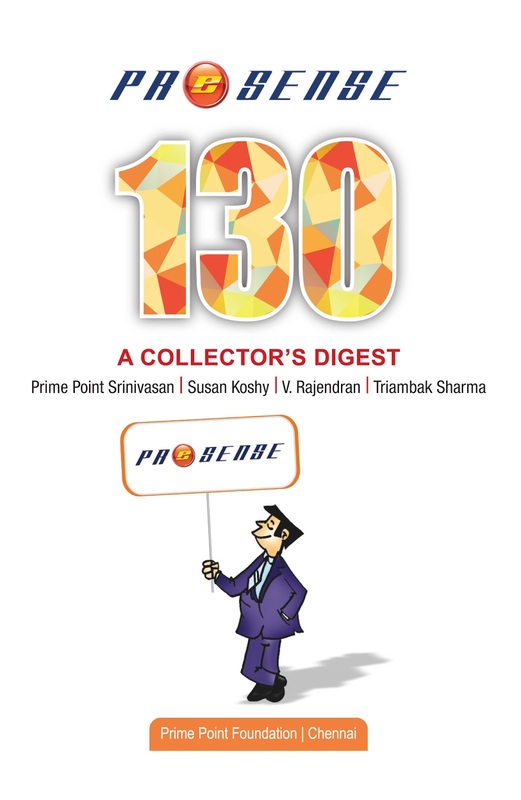 This issue of PR-e-Sense is also integrated with a PodMagazine (Edition 13). This podMagazine carries interviews with eminent persons listed above. This edition of PR-e-Sense carries the theme Corporate Misconceptions and Idiosyncrasies" on media and communication. Eminent people like Mr K Ramasubramanian (Mg. Director, Masscom PR, Coimbatore), Mr R Gopalakrishnan (Business Editor, The Hindu), Mr R Ramamurthy (Member of CII and FICCI) and few others have shared their views. This issue of PR-e-Sense is also integrated with a PodMagazine (Edition 9). This podMagazine carries interviews with eminent persons listed above. This edition of PR-e-Sense carries the theme "PR bodies in India". This editions discusses the ole of PR bodies in developing professional excellence. Eminent people like Ms K Bhavani (President, Institute of Public Relations, Singapore), Dr C V N Reddy (Editor, PR Voice), Mr C J Singh (Mg. Director, Core PR, Chandigarh), Mr Yogesh Joshi, (President, Associaiton of Business Communicators of India) and many young / senior professionals have shared their views in the ezine. This issue of PR-e-Sense is also integrated with a PodMagazine (Edition 7). This podMagazine carries interviews with eminent persons listed above. March 2007 edition of PR-e-Sense carries the theme "PR education in India". This edition gives the various aspects of PR education in India, Instituions offering PR education, expert views, etc. This Feb 07 Corporate ezine PR-e-Sense deals with the various aspects of Wikis and their strength. We also bring out an exclusive podcast interview with Jimmy Wales, Founder of Wikipedia. This edition deals with various healh issues of the persons employed in corporates. This ezine is also integrated with podcast. This edition deals with HR Branding. Experts share their views as to how a company can become a 'preferred employer'. This ezine is also integrated with podcast. This edition of ezine focusses on the 'hidden strength' of Indian Regional language media, when compared to English Media. This ezine also is integrated with podcast. This edition focusses on various aspects of Corporate Press Releases. This ezine is also integrated with podcast. This edition focusses on the emergence of social media like Blogs and how they could be used in Corporates for building their brands and communication internally and externally. This edition is integrated with Podcast. This edition of ezine focusses on the various soft skills and attitudes required for freshers, middle level managers and senior level executives. We have also integrated this ezine with podcast interviews from eminent people. This edition discusses various aspects of Corporate Websites. We have also rated some of the popular Corporate websites. This issue focusses on Internal Communication in Corporates. We also carry the lead story from Mr T S Krishnamurthy, Chief Election Commissioner of India (now retired) on the various Internal communication aspects in conducting the world's biggest mega event, viz. Indian Elections. This issue of ezine deals with the Accreditation of Public Relation professionals in various countries. This issue of ezine carries the theme "Corporate Governance and Corporate Communication" with eminent people sharing the views. Prime Point Foundation has launched during March 2006, a monthly Corporate ezine. The inaugural issue was launched by Prof. Y S Rajan, Principal Advisor to Confederation of Indian Industry (CII). Every month the ezine will focus on one 'theme' relevant to corporates.